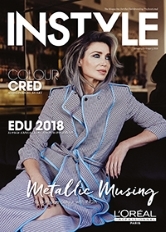 INSTYLE is Australia’s leading hairdressing industry magazine and is an authoritative source for news, reviews, interviews and inspiration for salon professionals. INSTYLE sets the benchmark for hairdressing business and has built a reputation as the only magazine to include in-depth stories and features on all brands, products, services and issues facing the industry. Proudly the industry’s longest serving magazine, INSTYLE has been inspiring and educating hairdressers for more than 23 years and continues to define trends with six issues per year. INSTYLE offers useful information for practitioners and a broad industry perspective for business-focused decision makers, mentors and educators. It provides the opportunity for stylists at all levels to showcase their talents and is distributed free to salons across Australia. Styleicons.com.au is an interactive social environment for the hairdressing industry. Rich with the ideal mix of content to fuel a creative mind, this inspirational community has been designed to propel the industry’s business and creative minds and motivate the next generation of the hair and fashion leaders. Through a delicate balance of information and aesthetic appeal, styleicons.com.au updates all industry professionals with a subtle mix of news, events, people, business, product and lifestyle news, as well as all things hip to ensure any creative professional is not left untouched.